Each caplet contains 1000mg of Vitamin C prepared in a specially formulated nutrient network of natural fruit pulp extracts, Acerola Cherry and Rosehips as well as the complete Vitamn C complex of co-nutrient factors including Rutin, Hesperidin and Bioflavonoids. These co-nutrients are important because they are found with Vitamn C in citrus fruits and they possess preventive health benefits of their own. 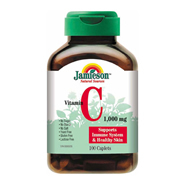 Each caplet contains: Vitamin C (ascorbic acid) 1000mg. Prepared in a specially formulated nutrient base of natural fruit pulp extracts, acerola, rosehips and the complete vitamin C complex of rutin, hesperidin and bioflavonoids.